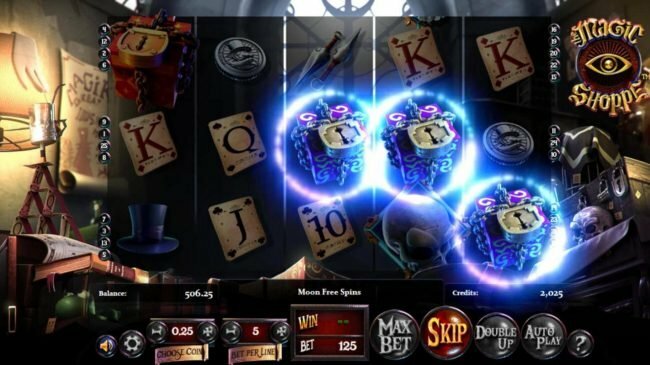 Slot review of Magic Shoppe online slot machine thought up by Bet Soft developers with 25 lines and 5 slot reels. 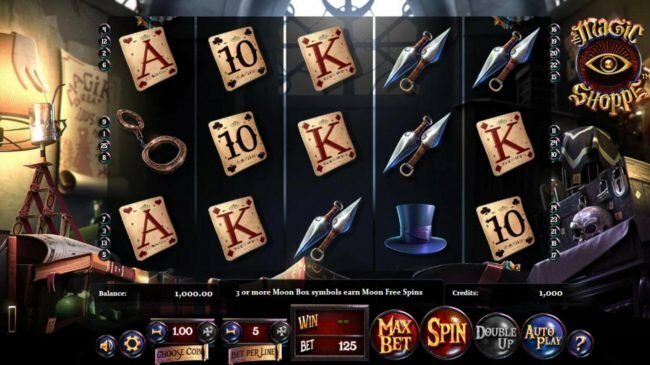 Magic Shoppe Slots has not been reviewed yet, be the first to rate this slot. 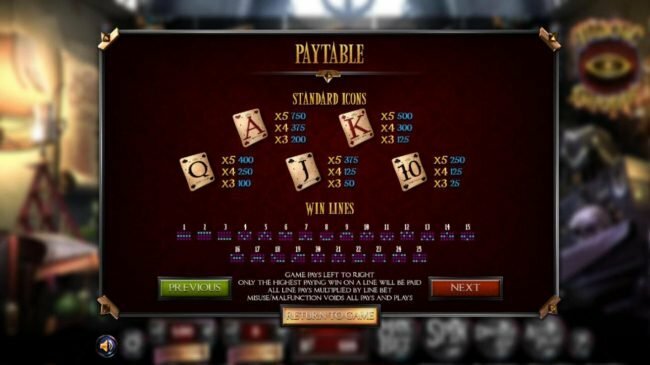 While we create a new online Slot Machine such as Magic Shoppe, we take into consideration quite a bit of data. Mainly we take note that there are 25 pay lines in conjunction with 5 reels. 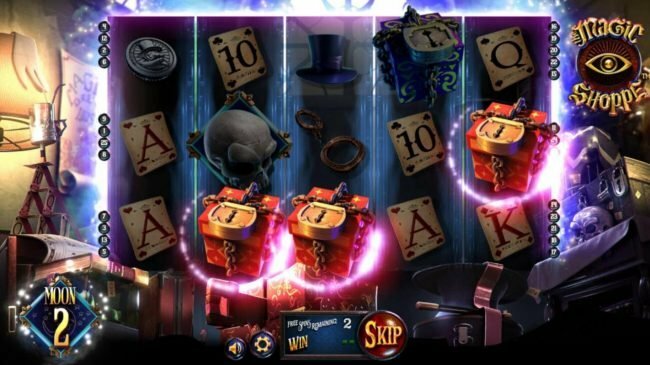 This magician tricks theme based Slot machine shows off its thought in production with skulls, hand cuffs, daggers, coins and top hats, and also Magic Shoppe drives it through with wrapping up the complete feel. Starting to play Magic Shoppe you are given the option of playing for as little as just $0.02 per spin. Additionally you also can include all 25 lines to wager a bet as big as $125. 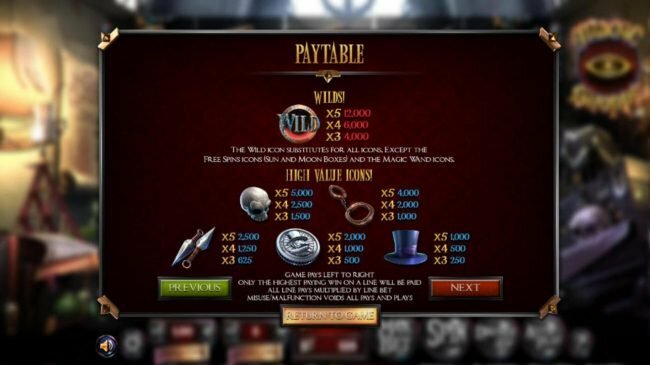 An insane win will have multiple wild symbols on Magic Shoppe in the pay line. 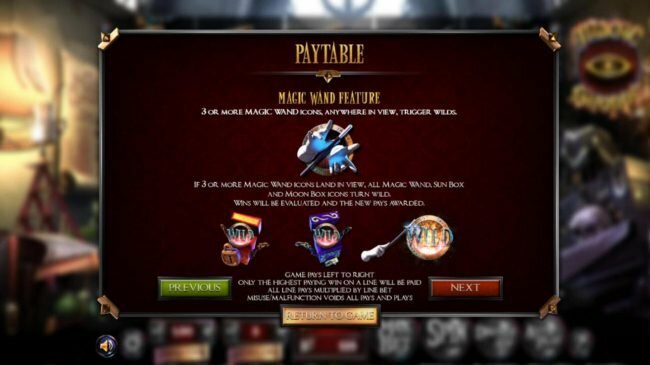 The scatter symbol used on Magic Shoppe are a magic wand scatter, sun box (red) and moon box (blue), these scatter pay out if you have multiples in the video slot. These unique symbols do not need to be on the same pay line to be activated. When you see right away your pay lines are failing to match there is still a good an ability of winning big with the scatter grouping. I can point to other online games like Reel Outlaws as it has 25 lines like Magic Shoppe, similar Slots like Mega Gems and Aztec Treasures 3D are fun also. 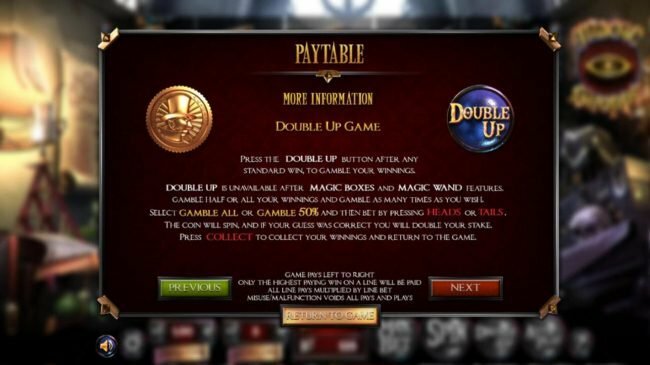 As a lot of Bet Soft slots like this type act similarly so be sure to pick out a winner. 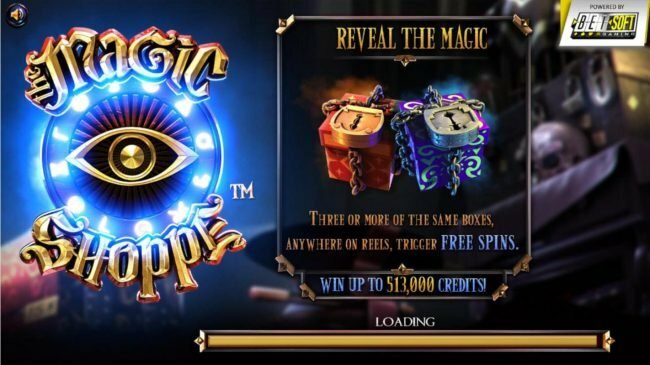 We truly loved playing Magic Shoppe, the magician tricks produced slot offers some good amount of work that sets you inside the game displaying the skulls, hand cuffs, daggers, coins and top hats art and graphics. 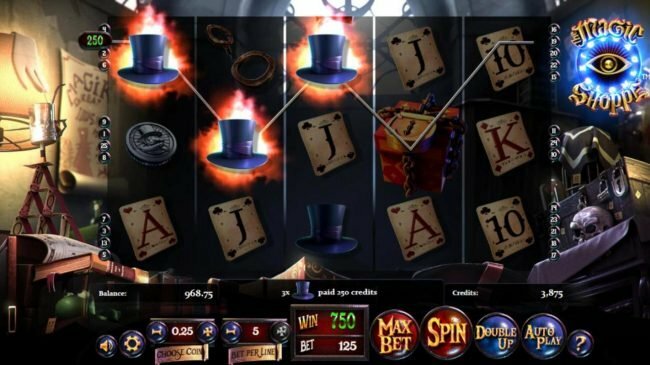 Like other online slots there is a decent chance of cashing out a large amount but in the end all slots lean towards house. In the playing of Magic Shoppe offers a fun ability to win really big amounts of cash, this is done by getting a bonus feature win! Here are the details on the Bonuses you are able to get. 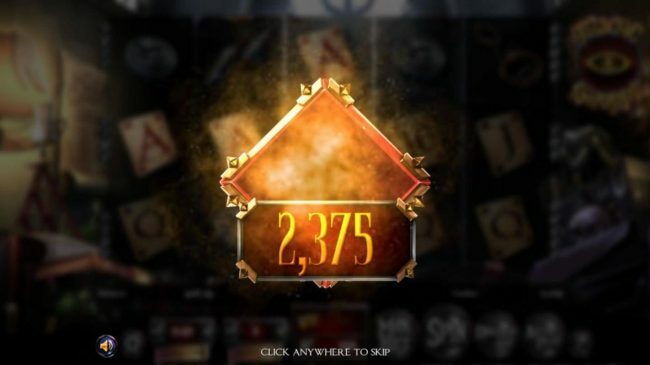 If you enjoy huge piles of credits, the Magic Wand Feature would seem to have been designed for you. It's as simple as getting three or more magic wand icons anywhere in view, turns all magic wand, sun boxes and moon boxes in view into wilds to launch. 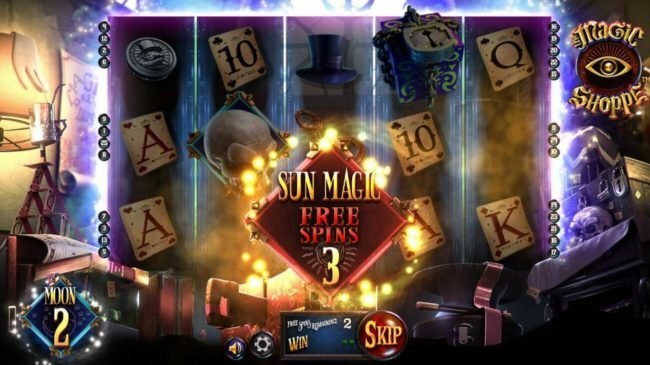 Get three or more sun boxes appearing anywhere on the reels awards 3, 6 or 12 free spins respectively. This will start the Sun Free Spins bonus Game. 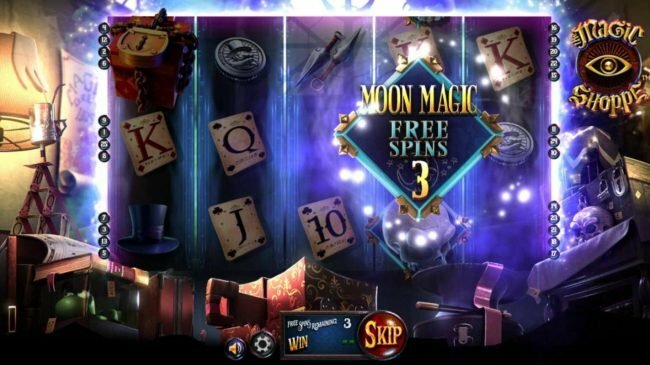 To win the Moon Free Spins feature game, begun by getting three or more moon boxes appearing anywhere on the reels awards 3, 6 or 12 Free Spins respectively. 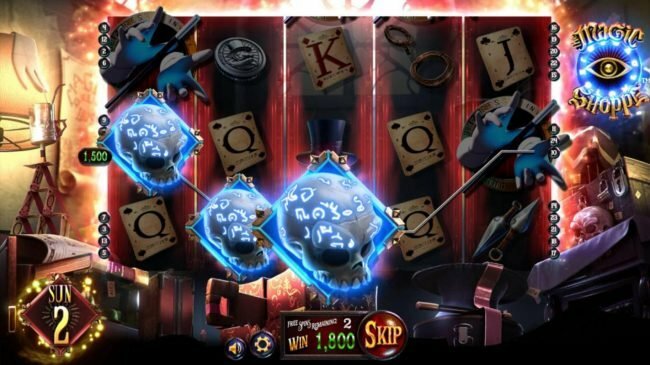 I am sure you realize that like all Casino Bonus rounds, the Magic Shoppe feature offers a shot to achieve a fat Bonus win. you almost don't pay attention to the actual game play. 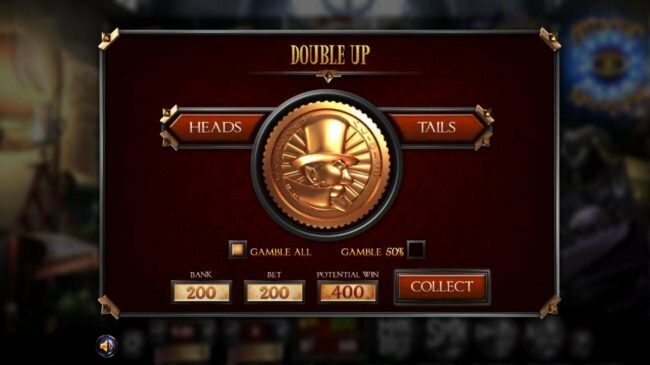 Be sure when you use a No Deposit Casino Bonus code from Drake Casino as you know with Arrows Edge and Bet Soft run Online Casinos, you have to make a qualifying deposit if the last Casino Bonus was also a no deposit one. Note that Antigua and Barbuda, Canada, China, Israel, Nigeria, Pakistan, Sierra Leone, Somalia and Sudan players are restricted at Drake.